St Mawes Holidays: Great Roseland Food! There are two great culinary reasons for visiting The Roseland this season. As well as all the great Cornish pubs in the area using fresh local produce, Rosevine near Portscatho now offers some real treats. The Hidden Hut on Porthcurnick beach underwent a major revamp last season when local's Jemma & Simon took over the running of the once beach shop, now gourmet extravaganza! On certain evenings throughout the summer they host 'feast nights'. Simon, a professional chef & skilled fishmonger cooks al fresco on huge paella pans over gas, wood-fire and charcoal. There's not much he can't rustle up in a paella pan! All events up to the end of June are already sold out. This is hardly surprising when you could be sat on the edge of the beach, looking out over Gerrans Bay, with a glass of something cold (BYO booze, crockery/cutlery and rugs!) snacking on Fowey River Mussels, with coconut chilli, or Lobster with handcut chips! The food is amazing, the views are stunning; quite simply there's no place like it. New for 2012 is Beach Tapas! Their new standard lunchtime offering. This is in addition to ad hoc BBQ's and Soup Sunday's. The Hidden Hut is proving massively popular this year, they have a great website where you can book tickets for events (they sell out in a matter of days!) and join their newsletter for notification of new events. 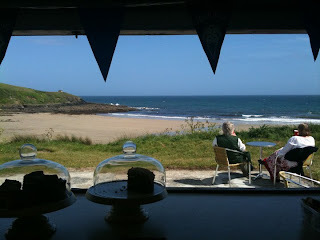 We wholeheartedly recommend a visit, even if just for some tea and cake after a hard day on the coastal path. They are open Tues-Sat 10am-5pm and Sundays from 12-3pm. 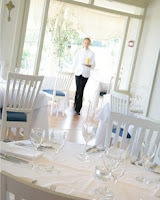 Just up the road at the Driftwood Restaurant you will find a thoroughly well deserved Michelin Star. Head Chef Chris Eden is the first Cornishman to receive a Michelin Star in Cornwall, and we couldn't be happier for him! 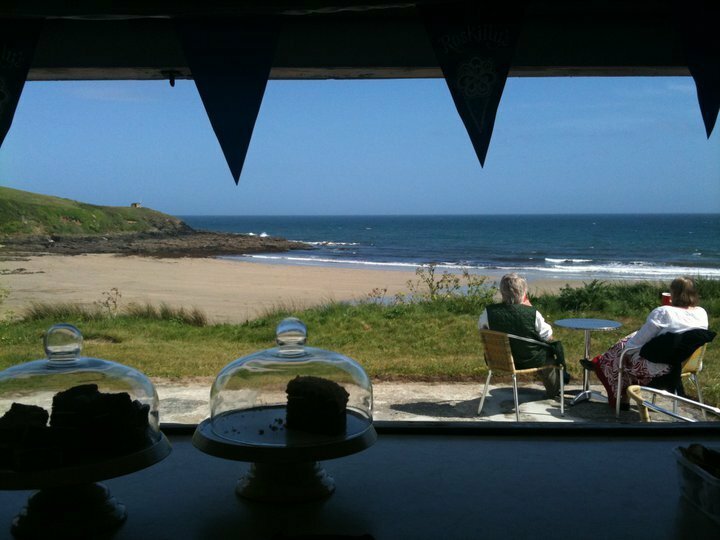 The restaurant also holds three rosette's with truly stunning views across the sea. A short footpath from the hotel leads down to a beautiful secluded beach away from the crowds. The Driftwood Restaurant promises wonderful fish and shellfish from Cornish Waters and locally reared meats. Their sample menu includes Poached Ray Wing, Saddle Back Pork Loin, Turbot, Sea Bass and Whole Local Lobster, followed by Tregothnan Lemon Verbena Sorbet, or Spiced Pineapple Carpaccio amongst a whole host of other delicious dishes. Their website even shows their Chef preparing an item from last seasons menu, shoulder of local lamb, viewable at the bottom of this page. All in all, the Roseland is turning into foodie heaven. When you include great pubs such as the Roseland Inn, Philleigh, The Quarterdeck at the Nare Hotel and The Watch House Restaurant in St Mawes, you could have a culinary extravaganza every night of the week! We're always keen to hear your thoughts on all the great food the Roseland has to offer, so do please let us know where you've eaten and what you've enjoyed. St Mawes Holidays is part of cornwallscottages.co.uk and offers a range of fantastic holiday cottages and self catering holiday homes across the idyllic Roseland Peninsula in Cornwall. If you have never visited the Roseland Peninsula before, why not visit our website at stmawesholidays.co.uk where you can browse our many properties with lots of photos and video tours, check availability & prices and even book your holiday online. Short breaks are available during quieter periods for most properties and for a few, all year round. If you would like to visit St Mawes or the Roseland for a week or just a few days, please do visit stmawesholidays.co.uk first!